I did another small minky quilt. Feather wreaths and vines. I used Fil-Tec’s Premo Soft thread and loved it. In the brown border I used King Tut on top and I wished I’d used something thinner as the brown showed up on the white backing in places. I used 80/20 Legacy blend for batting. I absolutely love how minky quilts. ← Get your Groove on! This is beautiful quilting – at its finest! Great job! BTW, I LOVE the Fil-tec magna bobbins that we bought! Haven’t used anything else since I tried those!! LOVE THEM! I liked the magna-glide bobbins too. I used them on the skulls/bats quilt I did recently (post coming up about that). I didn’t have any breaks using it and my tension was very easy to control. You can buy them directly from Fil-Tec’s website, too. http://www.bobbincentral.com/ Their website is cool, because it gives you coordinating color choices in different threads and bobbins. I’m thinking I’m not liking this roll of Legacy 80/20 blend – it is extremely linty. So much so that I need to clean out my bobbin casing sometimes in the middle of a bobbin. I always clean it when I change the bobbin, but this is a bit extreme. 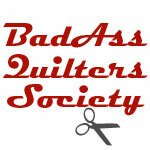 Thanks for the compliments – coming from an award winning quilter as yourself – it means a lot!